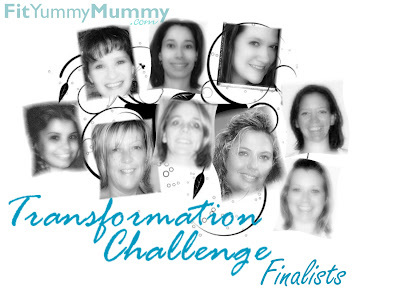 Vote For Your Favourite Fit Yummy Mummy Transformation! Challenge has come to an end. Now the voting of who will take home the grand prize begins. take home the Grand Prize for the Yummy-est Results! The Top 3 Winners announced on Friday, November 6th. to send your friends and family to the Challenge Voting Website. VOTE HERE for the Yummy-est Fit Yummy Mummy! See who is most inspiring to you! Let's Rock the Vote for Fit Yummy Mummy's! completing the 12 Week "Get Back To Fit" Fall Transformation Challenge. for the first time with confidence. every day! That is what sabotaged me in the past. 3. Social support is crucial. support there is no way I would have finished. And Be Honest - no sense fooling yourself. mistakes you made and move on. if you fell off one day. 9. Look for inspiration wherever possible. that really get you excited and read it often. 10. Take it day by day. will be victorious in making it to the end! ever a slip up, calm down , own up and get back up! the 12 Week "Get Back To Fit" Fall Transformation Challenge! Have You Decided Yet? What Are You Waiting For? Today is your day to choose. Keep doing what you’ve always done, and get the results you’ve been getting. …Follow a proven formula that guarantees your success. Today is your absolute LAST chance to get Holly Rigsby’s Fit Yummy Mummy DVD Set that is literally a done-for-you, follow along fat loss solution. You want to know why most people fail? It’s not because they don’t have a plan. It’s because they can’t follow the plan. That’s why Holly’s DVDs are the perfect fat loss solution. She teaches you exactly how to do everything in the Learn IT section on each DVD and then coaches you through the entire workout in the Do It section of each DVD. It’s paint-by-numbers simple fat loss. But only if you order before 3pm today. P.S. – Holly has included over $250 worth of tools and resources guaranteed to get you back into your skinny jeans, but only if you order today! All Your Questions Answered Right Here By Holly!!! You have asked and Holly has answered!! With the Fit Yummy Mummy Workout DVD Packages only available until tomorrow, myself and of course Holly have received SO many wonderful questions and feedback about them!! To help answer the most common of these questions and give you the best advice possible I have posted for you exactly what you need to know below from Holly herself! You can find the DVD packages if you Click Here ->Fit Yummy Mummy Workout DVDs or read further for more information on them! What’s the difference between your Fit Yummy Mummy program and the DVDs? The Fit yummy Mummy Fat Loss system is a downloadable ebook. This is a complete lifestyle system…meaning I cover motivation, nutrition and exercise. I keep it simple - sticking to whole natural foods, providing a create a meal menu planner and step by step guidelines for making positive changes eating and lifestyle habits, mapping out 15 minute workouts with workout logs that have links for the full color and exact description of how to do each exercise. There are 16 weeks plus 12 weeks of advanced bonus workouts.–basically breaking it down so getting started is not overwhelming. Do you need BOTH the DVD Package and the Fit Yummy Mummy ebook? This is a personal decision. Just depends on you – where you are in your fat loss efforts and what your goals entail. For example, if you have already set your goals, adjusted your mindset, established a support system and are making an honest effort to make healthy changes to your nutrition plan – and really the only thing missing in the formula for success is an effective workout plan? Then No, there is no reason to get the Fit Yummy Mummy ebook. The DVD Package will be all you need to kick start your results. Now on the other end of the spectrum, if you are JUST getting started and have no clear direction or step by step path to follow, then I highly suggest you consider investing in the full Fit Yummy Mummy ebook. There is one flat rate of $9.95 for both DVD Packages no matter where they will be shipped. DVD Package are shipped out of Illinois using USPS 1st class shipping. Estimated times range 7 to 10 business days or sooner. If you live outside of the United States it may take 2 to 3 weeks. All DVD orders are being processed this week and will be ready to be shipped on October 12th. Depending on where you live and considering the information listed above is when you can expect to receive your DVDs, you can estimate from there - - please note, there is no reason to wait for you have the downloadable workout log for each and every DVD in your Package. So you can get started as soon as you purchase your package! The DVD event is offering 2 package options for you! Basic and Deluxe. Each DVD has workouts – Workout A and Workout B to rotate between for 4 weeks, complete with downloadable workout logs that explain How To Use your workouts, how to track your progress and even suggest ways to increase the challenge of your workouts so you never hit a plateau. Only exception to the A/B Workout Format is the Fit Fast Body Weight Circuit DVD which has 3 workouts to rotate between for 4 weeks. What can I expect with these workouts? I hope you had a chance to experience one of my 15 minute workout sessions when I offered the Bonus Fit Yummy Mummy Videos last week. If not, posting one sample below. The Fit Yummy Mummy workouts are traditionally performed in Super Set Style. I design workouts that contain 6 exercises and I pair them up into super sets. Super sets are performed like this: a1, a2, a1, a2, a1, a2 rest… b1, b2, b1, b2, b1, b2 rest….c1, c2, c1, c2, c1, c2 Finished! This takes a mere 10 to 15 minutes, the moves I have chosen for you target all the major muscles in your body for a challenging full body, fat burning, metabolism boosting workout in just 15 minutes! If you missed it - here’s a sample workout again…Give it a try and see what I mean! Yes, these are workouts you can do right at home and in just 10 -15 minutes! You will need a couple dumbbells, a mat (or a soft place to do floor exercises), a stability ball, a medicine ball (no worries if you do not have one, you can use a DB as a sub) and something to step up on…whether it be a chair, a stairway or a workout bench if you have one handy - I do not - I just use the bench on my patio and it works great! This is the type of workout equipment many of us already have – it’s just that we did not learn how to effectively use it, so instead these items have been stored away and are collecting dust – Not once you get your DVDs! If you are like me, they will be sitting out in the corner ready to be used at any time of your busy day! I teach a more effective form of cardio called Intervals! What about a Nutrition Plan? You will find many references on how to eat for fat loss in the various bonuses you are receiving in your DVD Package. I am working on a way to provide an UNANNOUNCED Nutrition Plan Bonus for everyone who takes action and grabs their DVD Package by Friday at Noon EST – since I am traveling, I will do my best to put something together for you – so be on the lookout with your FYM Newsletters!!! Can I just buy single DVDs? Single purchase DVDs are not available at this time – and sure at some point they will be, but I am unable to predict when or how soon – just have so many other projects on my list of to do’s – especially with the holidays coming up. Absolutely – and if you look closely…..These DVD Packages ARE discounted! Keep in mind, that these are DVDs that Fit Club Members have been investing in for $39.95 a month! So with the Basic Package you are saving over $20 …and with the Deluxe you are saving over $160! This discount does not even include all the bonuses worth WELL over $150…and you get these for FREE. If Price is an Issue…. You absolutely may break the cost of your DVD up into 2 payments! Still scoffing at the cost? When was the last time you totaled up the number of DVDs , workout books, magazine, workout gadgets, diet plans and even diet pills? Sure adds up doesn’t it! Yet, somehow you found the money to be able to afford these items, items that only left you frustrated with a lack of energy, confidence or results. AND….. I will just point out one final time that if you were to hire a personal trainer to design 6 to even 18 fat burning workouts for you – you are looking at investing anywhere from not to mention the additional cost of the gym membership where you must go to meet your trainer. BTW: Even when I ran a special on my one on one training sessions back in the day – 6 sessions was $180 and 9 was no less than $270. I am offering myself to you – to be your personal coach, to guide, motivate and hold you accountable from the comfort of your own living room …for less than 2-3 visits with a trainer. So jump on over – grab your DVD Package – and be on the lookout for even more bonuses and specials once you take action to burn the baby fat and get your body back! Reminder, the Fit Yummy Mummy Workout DVDs are only available until 3pm tomorrow, Friday Oct. 9th! Head on over and make sure you do not miss out! Yesterday I (along with my friend, Holly Rigsby) told you about the difference between trying to follow a workout and actually doing a workout as it’s designed – and how much impact that will have on your results. Let’s talk for a minute about those workouts. A lot of people make the mistake of thinking they need to workout for an hour or two a day, doing miles of long, slow cardio to reach their fat loss goals. You’ve been lied to by health clubs, infomercials and expensive personal trainers – all telling you that you need to work out for hours on end to get the body you want. You’ve been told too that you can spot reduce your trouble spots and you can use the ‘fat burning zone’ to lose your love handles. It’s no wonder so many moms just give up. They don’t have time to sift through all the B.S. along with all of the other responsibilities on their plate. The truth is…you only need about 90 minutes a *week* to get the body you want. If you’re doing the right exercises in the right combinations, you can get great results in less than 15 minutes a day. If you want to burn your baby fat and get your pre-baby body back in only 15 minutes a workout, it’s critical that you know how to do every exercise with the right technique, in the right combinations, with the right intensity. Otherwise you’ll miss out on most of the results. I love these DVDs because Holly teaches you exactly how to do each move and then guides you through each workout to ensure maximum fat burning effectiveness. Basically, everything is already DONE-FOR-YOU! You just follow along and watch those unwanted pounds melt away. Hurry! Holly has included 6 Incredible Success Bonuses to jumpstart your success, but only if you order before Friday, October 9th at 3pm EST. What Are You Doing With Your Workouts? Did you know that having a professionally designed workout and following a fat loss nutrition system *still* doesn’t guarantee you’ll lose those unwanted pounds? I was just chatting with my friend and Moms Fat Loss Expert, Holly Rigsby and she’s discovered some interesting realities with her huge community of moms following her Fit Yummy Mummy Fat Loss System. They don’t work out at the intensity necessary to make their body improve. They don’t follow the proper workout design and maintain the pace of the workouts that I or other fitness experts prescribe in their programs. They simply don’t understand how to do the exercises by simply looking at a picture in an e-book. My revelation was this: many women *need* to have a follow along workout they can watch to achieve the results they want from their workouts. A plan is only good if it’s followed. As you probably already know, the best diet, the most powerful workout…they’re only good if the person trying to follow them knows what they’re doing. In other words, you can have the best workout in the world, but if you don’t know how to do the exercises properly, you’re not only going to miss out on results, but you might even get injured by using improper technique. You’re trying to follow the plan…but you don’t know what you don’t know. But if you’re willing to follow a plan and would like to know *exactly* how to do your workouts to get maximum results, you’re in luck! Today I want to tell you about the best FAT LOSS DVDs I’ve ever seen. Holly Rigsby has just released her Fit Yummy Mummy DVD Set with her patented ‘Learn It’ and ‘Do It’ sections so you never have to wonder if your workouts are giving you the results you’re looking for ever again. Each DVD has two of her best Fit Yummy Mummy Workouts, each complete with it’s own Learn It and Do It Section…plus if you take advantage of her special offer she’s also throwing in ready to use workout logs to guarantee you get the results you’re looking for. Today is the first day of a 72-hour special where Holly is offering a huge discount because these plans just went LIVE today. I highly recommend you pick up your Fit Yummy Mummy Workout DVDs if you’re ready to start losing those unwanted pounds and fit back into your skinny jeans! Hurry! If you order Holly’s DVD’s before Friday, October 9th at 3pm EST, you’ll also get her entire Yummy Mummy Makeover Series and 5 other bonuses worth over $250.